Who Is Qualified To Lead Oil Leak Control & Cleanup - BP or BO? Now I know that you are not supposed to & definitely are not required to indict yourself so you can understand just how shocked I was when BO admitted @ his news conference yesterday that he had been in charge & was personally responsible since day one - which was 38 days ago & counting - for control of the oil leak that resulted from the BP/Transocean Deepwater Horizon drilling rig explosion in the Gulf of Mexico on April 20. This is not the sort of thing most people would take responsibility for especially when they have no expertise in such matters. In fact shortly after the news conference began BO made another startling admission - namely that BP & the other oil companies were the only ones who have the technology to possibly stop this leak that originated in an oil reservoir that was 13,000 feet below the sea floor that was 5,000 feet below the water surface in the Gulf Of Mexico. Who in his right mind could imagine that the EPA, Coast Guard, Army Corp of Engineers, or BO - all of who have never produced a drop of oil in their lives could manage such a task? But this is the politically correct ignorant world we live in. As many of you know I spent my engineering -construction career building chemical plants all over the world. Part of this experience was building the incineration portion of sludge incineration plants for such clients as the City of Detroit (largest wastewater treatment plant in the world), the Cleveland Regional Sewer District, & the Orange County Water District. All of these clients were required to have a licensed professional engineering firm write the specs for our projects - which always without exception came with a performance guarantee - & of course approve our drawings & calculations & inspect our work in the field until the project was complete. The problem started when the professional engineering firm did not know how to write the specs & accordingly our sales engineering department wrote the specs for them. Once we became the low bidder the client's engineering firm justified their existence by finding everything wrong with our drawings & calculations that they could - of course delaying the project completion while we resubmitted the drawings & calculations. My experience with these municipal sewage treatment clients mirrors exactly what BO was describing @ the news conference re BP & government control of the clean up & control effort of the oil leak in the Gulf. Detroit's incineration plant projects would have been far more successful if the clients & their engineers would merely have gotten out of the way & let the people who knew the technology execute their performance contracts. If anything, since BP is responsible for the cost of the cleanup & every other damage they should be the kingpin in charge of the Gulf oil leak matter. BP should determine the government's role, if any, asking for help from the government, if any is required. Now I know that the leak occurred in federal waters & that in accordance with some ill conceived law that the federal government is legally in charge, but when you think of all of the above points you can clearly see one more colossal case of falsely relying on government when they really have no business being involved @ all - especially while industries & livelihoods are being destroyed. Chicago was rebuilt after its fire, as was Galveston after its hurricane, & San Francisco after its earthquake, all without a dollar of government money. The philanthropy & charity of the American people, coupled with the free market capitalistic system that has made America the envy of the world, restored these cities. This is the same force that ultimately will restore the Gulf Coast if BP fails to meet its obligations. The post-mortem examination of PA's 12th congressional district special election race (Critz-D-53%; Burns-R-45%) brought many comments such as the following two excellent ones: "When anyone talks about the FairTax they must emphasize that all other taxes are eliminated...& that the concepts are getting muddied between the VAT & the FairTax" as well as "I also wanted to call your attention to something disturbing that I read today in The American Spectator. The article is called The Triumph of Murthanomics. A few paragraphs in it talks about the mischaracterization of the FairTax by Critz. Unfortunately, it then warns that any Republicans that have endorsed the FairTax will be hammered by the Democrats this fall. It was rather discouraging." Both of these comments & certainly others received emphasize the importance of properly educating both candidates & the masses about the FairTax so that purposely misleading attack ads like Critz ran can be clearly & easily exposed for the lies they are. Don't despair this has been & continues to be the plan of FairTax leaders across our country & I must say especially in FairTax NJ under the leadership of the incomparable Jim Bennett. With re to Tim Burns, following the election, we have reached out to him to see if he now chooses to be rooted & grounded in this education. We will go to Pittsburgh to brief him, if he agrees, so that he can fend off the attack ads that the despicable Michael Steele & John Boehner told him to retreat from. Burns still has a chance in November in that 45,777 people voted in the Republican primary in PA-12, choosing Burns to run again in November & 82,695 people voted in the Democrat primary, choosing Critz. But in the special election that Critz won, Critz won 71,684 votes and Burns won 59,476 votes meaning that Burns won, and Critz lost, around 17 percent of Democrat votes. If Burns has the substance & backbone he appeared to have in the debate I hope that he learns from the special election experience & accepts our invitation for a FairTax briefing - if not he is just another politician that is best for us to do without so that the Democrats win & the Republic goes even farther in the hole so that it can come out quicker, if ever. In the meantime I ask all of you to consider reaching out to your sources of information to help educate them re the FairTax - just about all of them sorely need it. Below is my most recent letter to the WSJ challenging them to follow their own self described standard of excellence rather than to just accept the status quo that is leading our nation to ruination. Please feel free to use any of this letter to reach out to your own media - it is so vital that we all do. I care less about whether the Journal publishes my letter than that they accept & try to meet its challenge. As someone who has literally read your newspaper every day for over forty years I cherish the promise Charles Dow & Edward Jones made about the Journal - "in all things first, & in many things alone." This standard of excellence runs like a gold thread through all of your publications except when it comes to the FairTax. In your lead editorial on May 20 you call the FairTax a political loser because you theorize that voters will be afraid they will get the FairTax & an income tax - which of course no one wants. Your conjecture is like negotiating with yourself to accept a subpar result - something you can not stand in any other topic. The FairTax is the result of a $23 million peer review study over a three year period that has tens of thousands of followers. The WSJ would be doing a much greater service for America by trying to help correct the condition you describe rather than perpetuate it. Please study the FairTax principles & then if you agree with them promote the FairTax in your writings so that you will help people get the proper education about the FairTax that is so desperately needed for America. Late last month I posted the DCCC's video of the attack ad against the FairTax that was used in the special election race against Republican businessman Tim Burns who was running against Mark Critz for PA's 12th district House seat formerly held by the late John Murtha. Critz was a former aide to Murtha & he decisively defeated Burns on Tuesday 53% to 45%. There will be a rematch in November since both candidates also won their parties' primaries. But the most important thing to learn is how Burns & the detestable Republican Party leadership (Michael Steele & John Boehner) handled the attack ad & the race after the ad was presented. First, the ad that misleadingly stated that Burns supported a national sales tax that would increase the price of medicine & groceries by 23% was presented after Burns only said he would consider supporting the FairTax if elected. After the ad was presented the Republican leadership advised Burns to back away from the FairTax - as they have on numerous occasions to other candidates since they don't want the FairTax any more than Democrat leaders do. Burns obviously only had a rudimentary understanding of the FairTax & could not defend the onslaught so he backed away & may have sealed his fate as a loser in the process. About two weeks ago I watched the Burns-Critz debate on TV & Burns was a model candidate looking like the Rock of Gibraltar as Critz kept dropping his microphone & water bottle - but Burns never uttered the word "FairTax." This is light years away from a candidate like Mike Huckabee whose entire tax position in his literature in the last presidential race was literally "I support the FairTax." 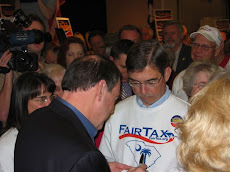 I attended three Huckabee functions in SC during that campaign & the Governor started every one of them with a presentation of the FairTax that took up @ least 25% of the total time he spoke. Governor Huckabee came from nowhere to finish in the final four presidential candidates while Burns was finished in one night losing to a bumbler. Several people have asked me why AFFT financed ads refuting the original attack ad seemingly defending Burns after he backed away. The push-back ads were funded by a Pennsylvania PAC organized by the advertising firm of Butcher and Butcher, which has a contractual arrangement with AFFT. The contractual arrangement is currently on a 6-month renewal while AFFT and members of the FairTax Leadership Council are reviewing it. The argument in favor of putting resources into this race was that AFFT was defending the FairTax, not Burns. The push-back ads do send a signal to other candidates in other races that FairTax will hit back if attacked. The other argument, of course, is that resources should go to candidates who will defend the FairTax on their own. We definitely need top notch candidates who are well versed in the FairTax but there is something to be said for the other point of working in tandem with the strong educated FairTax supporting candidate - & that is what we intend to do. Thanks to all of you - none of who live in PA's 12th district - who told me you sent letters against the attack ads & also in support of Burns when it looked like he might be a FairTax supporter. I share your disappointment in this entire matter. It is important to know where your candidates stand in the upcoming primaries in your state. The primaries are your best chance to find candidates who reflect your values - in NJ we have Dave Corsi (12th), Anna Little (6th), & Lon Hosford & Bruce Baker (both of the 7th) who are all unwavering FairTax supporters. 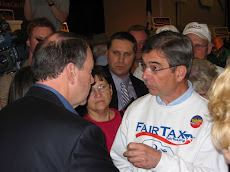 In Indiana all nine Republican candidates who won their primaries have pledged to support the FairTax if elected in November so let's hope for a sweep in Indiana. For the rest of us in the meantime please keep your powder dry until you find the candidate you are looking for & when you do support him with all of your might. Some people were astonished that there was a low turn out in such an important special election. I can only hope that every election has an extremely low turn out because people of substance in America today are so overwhelmingly outnumbered that a low turn out is the only chance we have to continue the Republic in a peaceful manner. For any one who missed Jon Voight's riveting open letter to America that he wrote & read on the Huckabee Show on FNC last month please check out the video below. The letter excellently articulates the dangers America faces under BO's insidious skillful training as a community organizer following Saul Alinsky's Socialist-Marxist method described in the book "Rules For Radicals." "Rules For Radicals" begins - "What follows is for those who want to change the world from what it is to what they believe it should be" & goes on to say it "is written for the have-nots on how to take it (power) away." Very succinctly put isn't it - just exactly what has been going on since January 20, 2009. As a natural follow up to the April 30 posting entitled "Unkind Benevolence Is Shorting America" many people have mentioned to me the internet slide show piece entitled "Argentina Then...America Now," so here it is. As the interest on the national debt & the unfunded entitlement mandates of the retiring 10,000 per day baby boomers overwhelmes our economic system just look @ the comparisons in the slide show of Argentina in the 1900s to America today & more importantly look @ where Argentina is today & you can project America's future on the road we are going down. Most people always have trouble making ends meet but I have found over the past year that people are just plain out of money to spend on anything other than their normal paycheck to paycheck costs to maintain their current modest standard of living. Now add in the costs of Cap & Trade & a VAT & the majority of people will be left with a disposable income that will be @ or near the poverty level - & it is all by BO's design as plain as the nose on your face. The April 30 piece referenced above asked "isn't shorting America's treasury securities even a more obvious bet now than shorting housing was a few years ago?" The WSJ ran a front page story today documenting the participation of members of Congress who did exactly that in 2008.